Iowa PGA Professional Chad Proehl is playing in the Principal Charity Classic this weekend at the Wakonda Club. You can follow along here. The Junior Academy Stroke Play event takes place on Tuesday, June 12 at the Pheasant Ridge Golf Course. Click here for more information. The Junior Academy Senior Stroke Play event will be the next day (Wednesday, June 13) at the Pheasant Ridge Golf Course. Click here for more information. The Iowa PGA has opened tournament registrations for the remainder of the 2018 season. The Professional Section Championship, 85th Iowa Open, Iowa Senior PGA Professional Championship and Iowa PGA Assistant Championship are just a few tournaments that highlight the remainder of the 2018 season. Click here to view the full schedule. 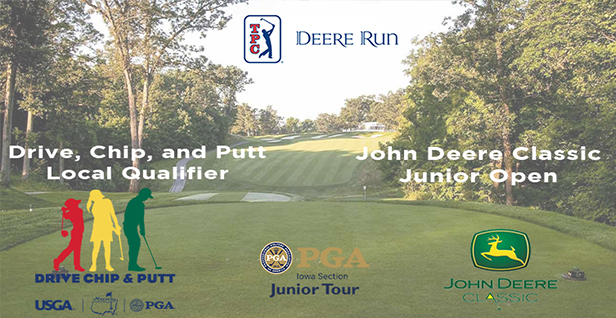 The John Deere Classic Junior tees off on Saturday, June 9 at TPC Deere Run. This two-day event will feature just the 9-hole age divisions. For pairings, tee times and general information please visit the tournament information page. The 18-hole age divisions will compete in the John Deere Classic Junior on Monday and Tuesday (June 11-12). For pairings, tee times and general information please visit the tournament information page. The first Iowa PGA Section Drive, Chip and Putt Local Qualifier is Sunday, June 10 at TPC Deere Run. For tee times and general information please visit the tournament information page. The 38th Annual Junior Golf Academy starts Sunday, June 10 at Pheasant Ridge Golf Course. This four-day academy features intensive instruction form Iowa PGA Professionals, daily playing lessons and tournament competition and lots of fun! Registration for the Wild Rose Casino & Resort Pro-Am closes Tuesday, June 12 at 11:59 p.m. Teams for this event will be comprised of one PGA Professional and three amateurs competing in a point quota style format. Click here to register. The Boy Scouts Pro-Am takes place on Monday, June 25 at the Davenport Country Club. Registration for this event is open and will remain open until June 19. This event is an 18-hole individual stableford with Open, Senior & Super Senior Division. The Boy Scouts will make up the amateurs. Click here to register. The Iowa City Junior at Pleasant Valley, State Qualifier for Big “I” Trusted Choice, Twin Pines Junior and Pee Wee and Junior Tour and Pee Wee Tour Corridor Classic all take place next week. Please visit the Iowa PGA Junior and Pee Wee Bluegolf schedule to register for events. Be sure to stay connected with the Iowa PGA on our all new IowaPGA.com and IowaPGAJuniorGolf.com websites and follow us on our Facebook, Twitter and Instagram accounts for the latest news.